through questionnaires responses provided by agents. lyzed in studies of this field are imperfect. Y. C. ZOU ET AL. final situation of $1500 richer. cates that people are loss averse. Figure 1. 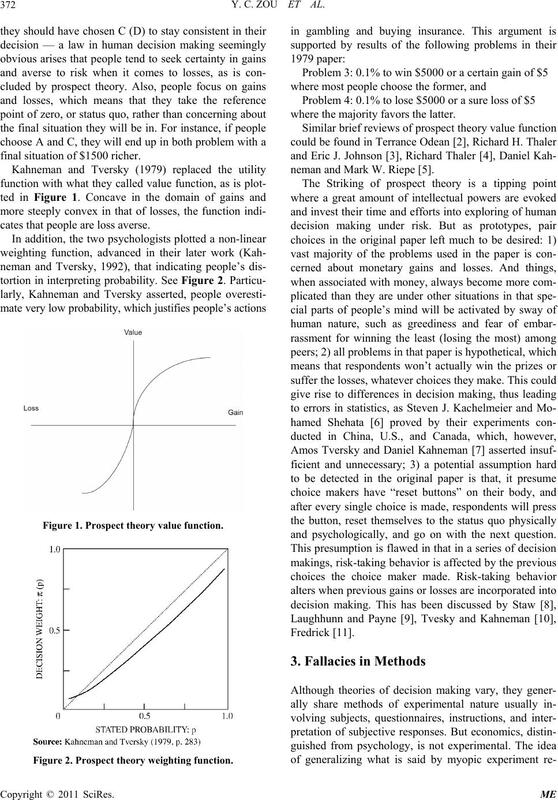 Prospect theory value function. Figure 2. 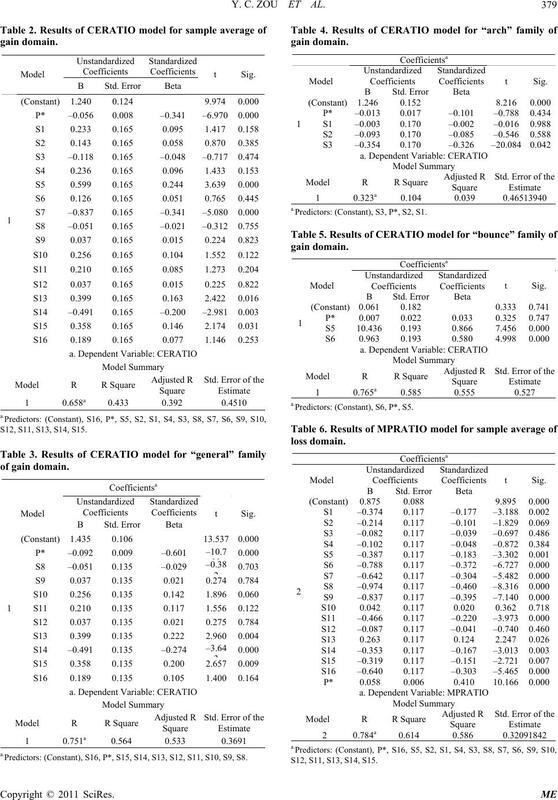 Prospect theory weighting function. where the majority favors the latter. neman and Mark W. Riepe . and psychologically, and go on with the next question. plotted in accordance with the majority’s risk preferences. value function. Note that the case is intensely simplified. Assume that 100 subjects are involved in this study. the preference of the majority. 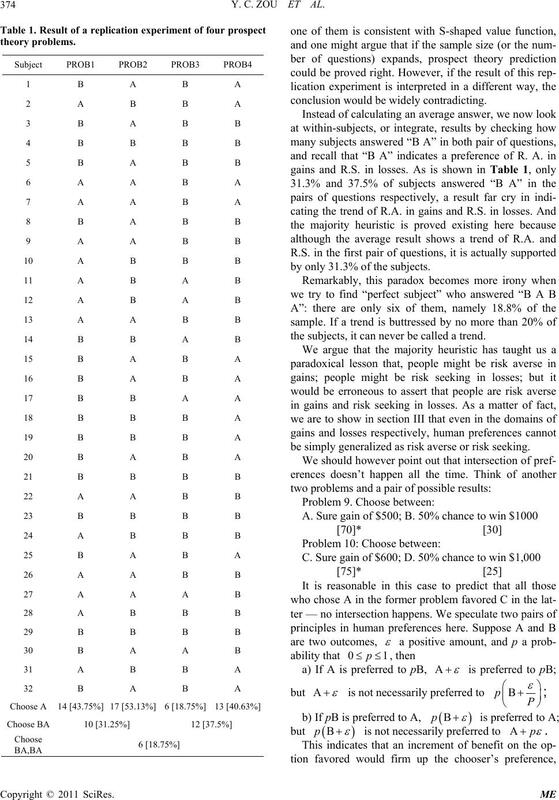 jects who chose A, 35 of them had chose C in Problem 8.
documented, rather than marginally, in an integrate way. percentages of subjects choosing AC, AD, BC and BD. averse in the domain of gains and risk seeking in losses. trend as existing if more than 50% of the subjects have it. A” in the two pair of problems. conclusion would be widely contradicting. by only 31.3% of the subjects. the subjects, it can never be called a trend. be simply generalized as risk averse or risk seeking. while increments on both sides don’t. stand later as a criterion testing subjects’ preferences. ourselves fully understand the statistics we are using. ion, the basic and long been misused statistic of average. in Class B got a better score than students in Class A.
ments involving subjects are conducted. say average should be abandoned in preferences analysis. employ this method into our experiment in Part III. simply generalized as “risk averse” or “risk seeking”. 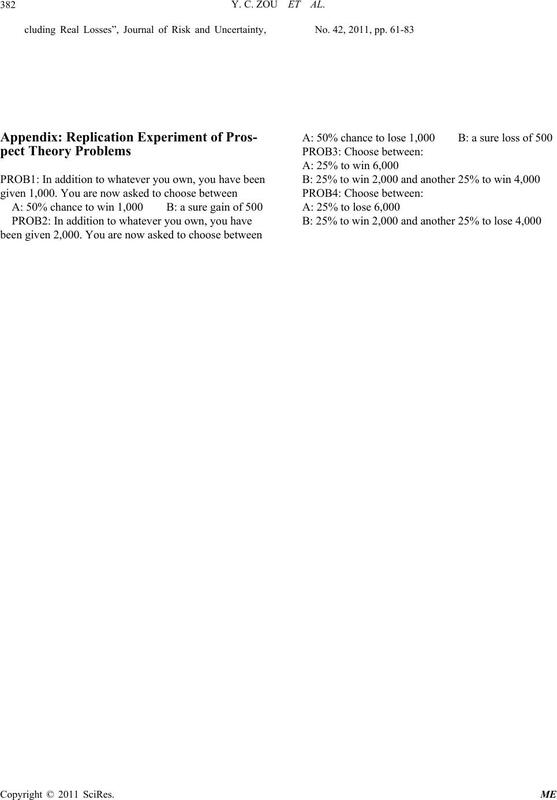 preferences under gambles of different prize level.
) for we, the designers, are Chinese). less than a half to win, and more than a half to win. ward possible gains and losses are discussed separately. picture. We avoid believing in average of the total. among the results and explain why they are like that. the maximum premium will be 0, thus MP/E is equal to 0. Figure 3. 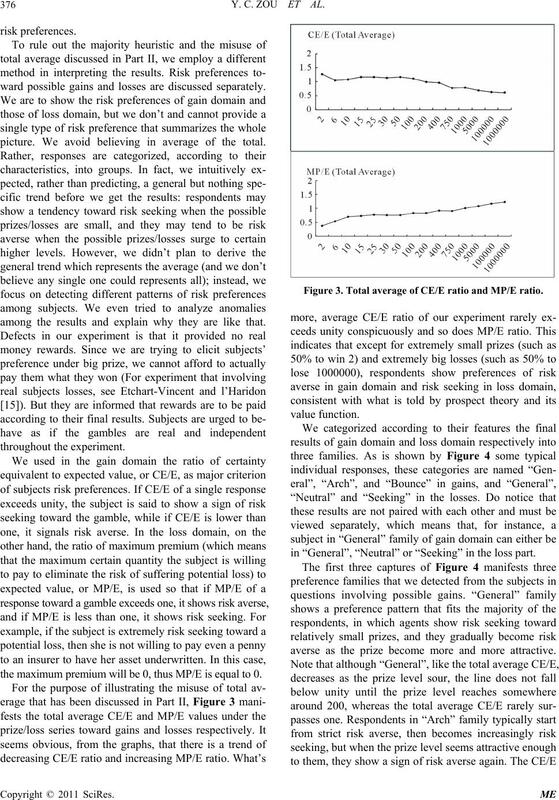 Total average of CE/E ratio and MP/E ratio. in “General”, “Neutral” or “Seeking” in the loss part. averse as the prize become more and more attractive. ally share risk preferences with those in “General” family. seeking, tending to run the risk of losing. 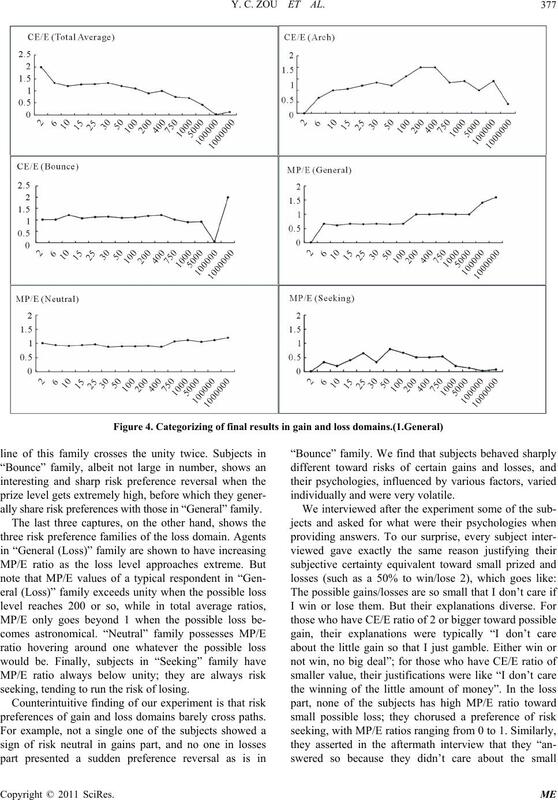 preferences of gain and loss domains barely cross paths. individually and were very volatile. of most subjects wasn’t consistent with this rationality. 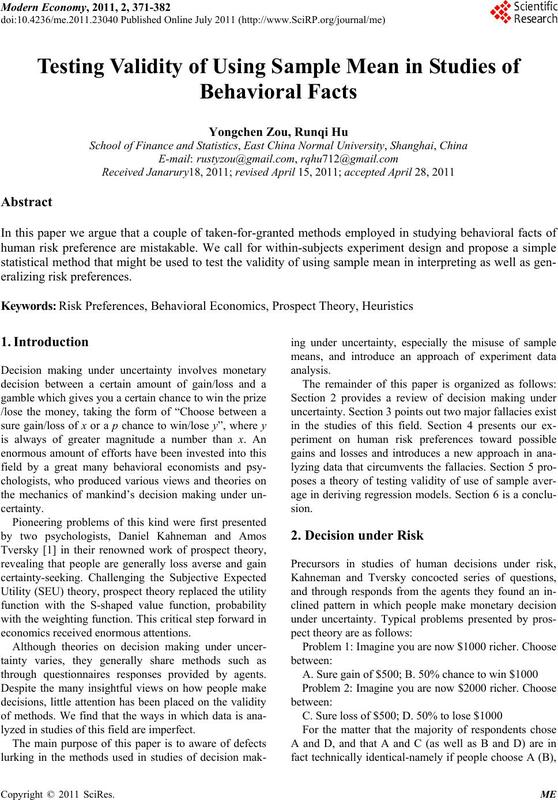 the subjects are risk neutral toward the gamble. and whatever happens is destiny. their fortunes still have a good 50% chance to stay intact. they are not representative to the population. 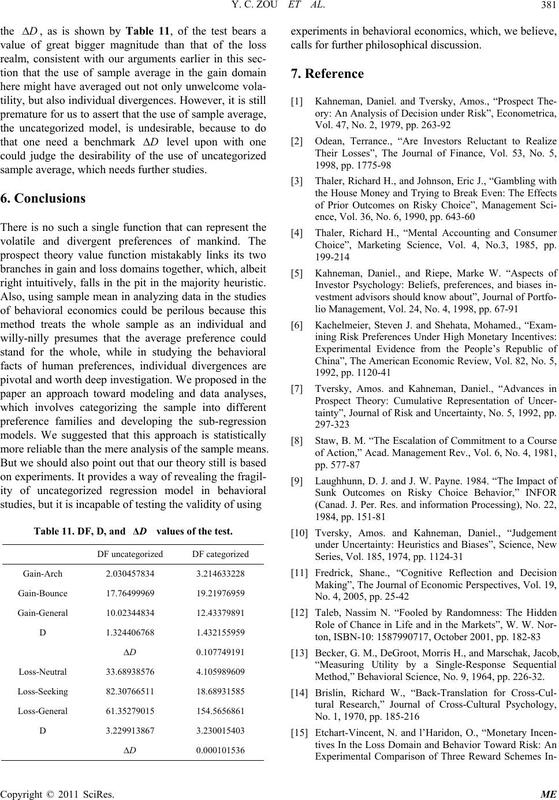 ple average regression models, indicating better stability. between subjects preferences which worth investigating. main bear sharply different shaped CE/E lines. S12, S11, S13, S14, S15. a.Predictors: (Constant), S16, P*, S15, S14, S13, S12, S11, S10, S9, S8. a.Predictors: (Constant), S3, P*, S2, S1. 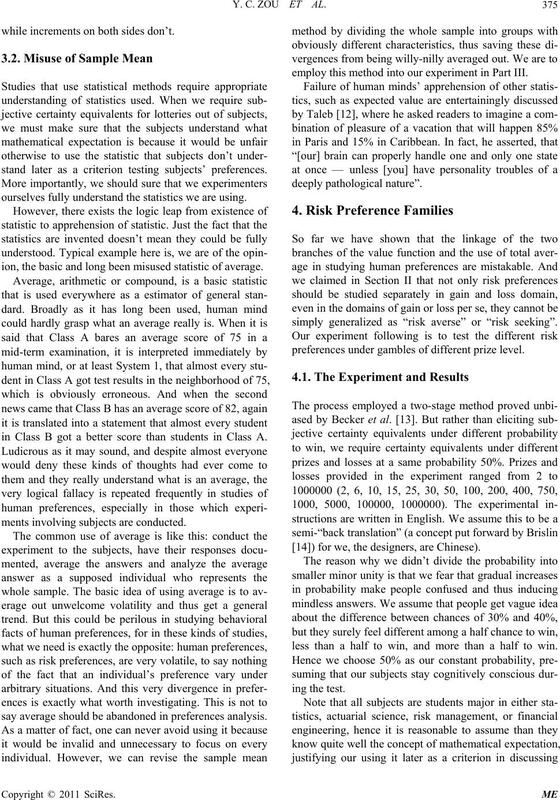 a.Predictors: (Constant), S6, P*, S5. a.Predictors: (Constant), S16, P*, S15, S14, S13, S12, S11, S10. a.Predictors: (Constant), S4, P*, S3, S2, S1. a.Predictors: (Constant), S8, P*, S7, S6. sample is categorized into families. 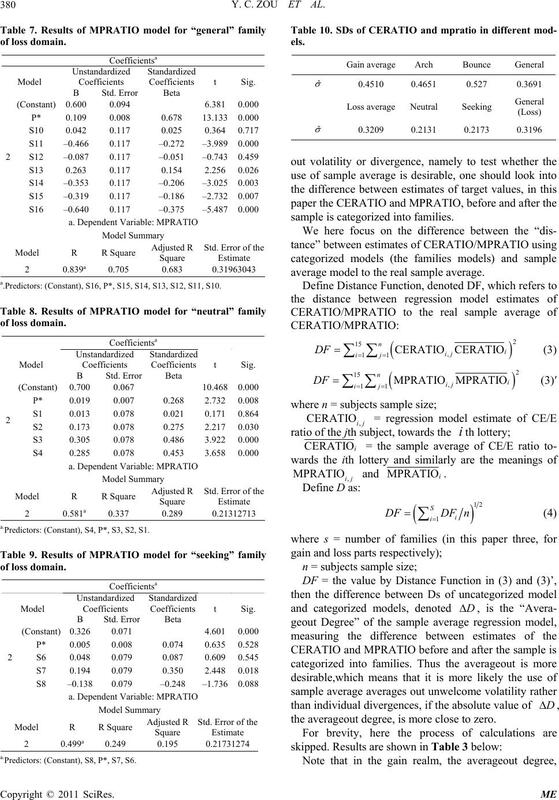 average model to the real sample average. the averageout degree, is more close to zero. sample average, which needs further studies. 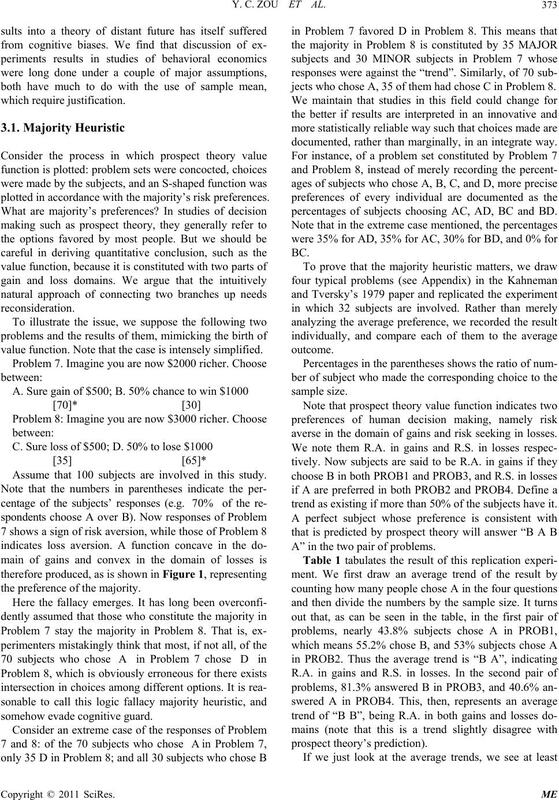 right intuitively, falls in the pit in the majority heuristic. more reliable than the mere analysis of the sample means. calls for further philosophical discussion. Choice”, Marketing Science, Vol. 4, No.3, 1985, pp. 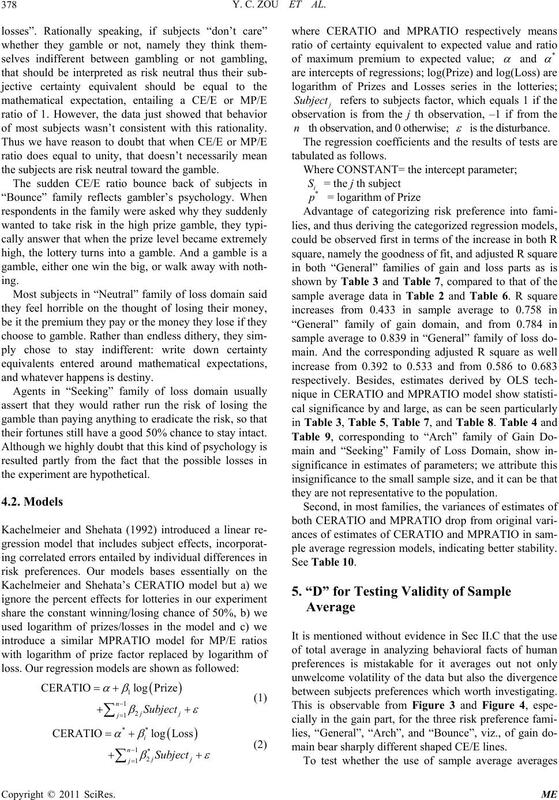 tainty”, Journal of Risk and Uncertainty, No. 5, 1992, pp. Method,” Behavioral Science, No. 9, 1964, pp. 226-32.